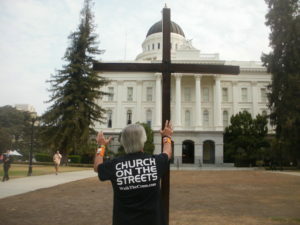 What A Sight To Behold For A Former Surfer Turned Cross Walker! He saved me one day. Street Evangelist Tom Alexander greeting and praying for people at Old Fisherman’s Wharf in Monterey. Cross walking’s giving me excitations. Good, good, good, good salvation. What started out as an early morning fog turned into a beautiful sunshiny day, the kind of awesome day I remembered when we lived and ministered in the San Francisco Bay area for fourteen years. Jeanette and I loaded up the “go-ye-mobile” and headed to Fisherman’s Wharf, just a few blocks from where we had stayed the night. As we slowly drove down the hilly street, the view of the pristine and wonderfully blue Pacific Ocean getting closer and closer by the moment filled my senses with both good and not so good memories of this beautiful northern California coastal town.